Robots are a reflection of us: Modeled after human nature, made to move like us. Just look to industry, where a new generation of robots is addressing the 4 Ds: dirty, difficult, dangerous & dull jobs, freeing us to do more interesting tasks. By taking over the menial jobs, industrial robots will once again allow many industries to competitively manufacture products in the US. 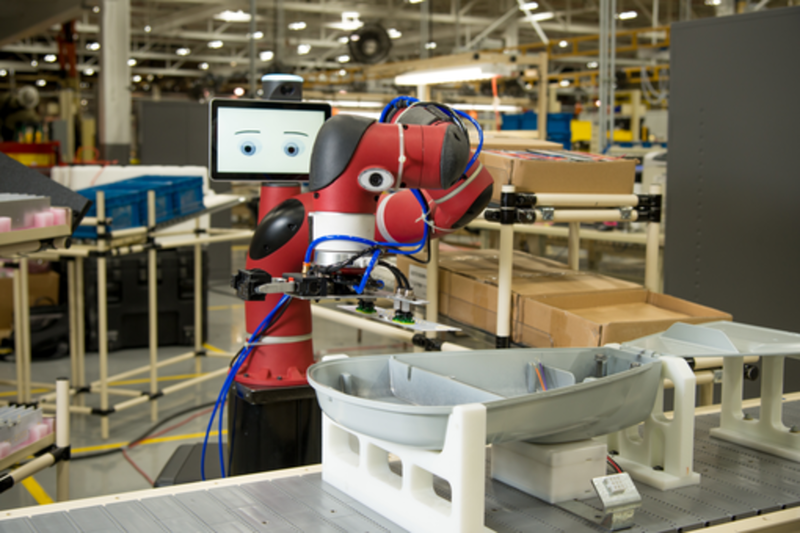 These new robots are adaptable & flexible, working alongside us on the factory floor. This synergy allows us to respond to changes in market demand on a dime, improved production runs, nimble multitasking & lower costs. What new things can we achieve with our robotic counterparts? That’s up to the human imagination. Jim Lawton built his career around finding better ways for manufacturers to succeed – from early days at HP to several successful software start-ups focused on supply chain management. So how’d he end up at a robotics company – not in manufacturing, but as Chief Product and Marketing Officer? Lawton sees great untapped potential for robotics in manufacturing, and sees Rethink on the vanguard of the new definition of automation. Sure there’s greater efficiency, higher productivity and lower costs. And it is not about replacing humans with robots. It’s about people doing what people do best and robots doing what robots do best. The next wave of innovation in robotics now will come as much from software as it does from hardware. Software imbues robots with intelligence that allows them to “see, feel and analyze” the environment they are in and modify performance – theirs, the equipment and the process. For Lawton, it makes sense that these robots will “learn” in manufacturing, where robotics and automation are an integral part of the business. From there, the sky’s the limit: services, elder care, and much more. He’s excited to be a part of it, and can’t wait to see where it will take us. Standards and Technology Visiting Committee on Advance Technology. Karen earned a PhD in Physical Chemistry from the University of Chicago and an AB in Chemistry from Bryn Mawr College. She was a member of the Charter Class of Kauffman Fellows.